This article considers the key substantive matters surrounding the recommendations by the Advisory Council on Intellectual Property (ACIP) for the innovation patent system and the process by which IP law reform is conducted in the future. It commences with an overview of the innovation patent system and proceeds to consider various factors relevant to the re-consideration of its appropriateness, including increased reliance on newly available data. In particular, it is suggested that while the availability of those data is an increasingly important part of future reform processes, there remains a need to consider other factors and to ensure that the relevant data is suitably scrutinised. It is also noted that the availability of data may lead some stakeholders to rethink their particular beliefs and fixed views as to what IP law reform should look like. E-commerce and the internet have given rise to novel legal issues, including whether new uses of words amount to trademark infringement. Considerable attention has focused on disputes between trademark owners and domain name registrants. To date, much less attention has been given to the trade mark issues relating to the use of marks as meta-tags in HTML documents. This article examines the main issues that arise under Australian trade mark law, namely: whether an invisible meta-tag amounts to a “sign”; and whether use of a mark in a meta-tag amounts to “use as a trademark”. The article also surveys the applicability of the allied actions of passing off and s 18 of the Australian Consumer Law to the use of marks as meta-tags. While Australian courts have yet to address these issues, a body of precedent has developed in the US and, to a much lesser extent, the UK. Following an explanation of a selection of these decisions, the article concludes with recommendations for law reforms to address the gap in current Australian trademark law, including the express adoption of a modified version of the US legal doctrine of “initial interest confusion”. 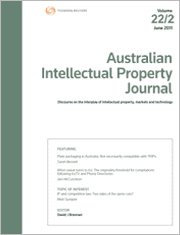 For the PDF version of the table of contents, click here: AIPJ Vol 26 No 2 Contents.